Students love the annual Pet Therapy Study Break at Emory’s Woodruff Library. Dogs from Canine Assistants and Pet Partners will visit for this year's break, set for 10 a.m.-4 p.m. on Thursday, Dec. 8. Emory’s therapy dog, Beowulf, will also attend. Photos by Wade Moricle, Emory LITS. Sign up online. Please arrive five minutes before your time slot. To help students relax while studying for exams and writing final papers, Emory’s Woodruff Library is bringing in stress therapy dogs, back by popular demand. The Emory Libraries’ Pet Therapy Study Break, set this year for Thursday, Dec. 8, from 10 a.m. to 4 p.m., allows students to put down their pencils and laptops to interact with man’s best friend. With an advance signup, students can spend about 10 minutes petting and playing with dogs in Woodruff Library’s Jones Room. The annual program started in 2012 and consistently sees over 200 attendees each year. This year two organizations will supply the dogs. Canine Assistants, a non-profit that trains service animals, has provided dogs for the library’s study break since the program’s first year. Pet Partners is joining the break for the first time. The company provides animal-handler teams to people and healthcare facilities in need of assistance and comfort. In addition to Canine Assistants and Pet Partners, Emory’s own therapy dog from Counseling and Psychological Services (CAPS), Beowulf, will participate. Her presence will serve as a reminder that CAPS, available to all Emory students, is an ongoing resource for those who may have difficulty coping with the stress of finals. Erin Mooney, Woodruff’s outreach and education librarian, started the pet therapy study breaks at the library after hearing of a similar event at Emory’s law school library. The librarian there provided her with a framework to plan the event, which she now passes along to others who inquire about starting their own dog study break. 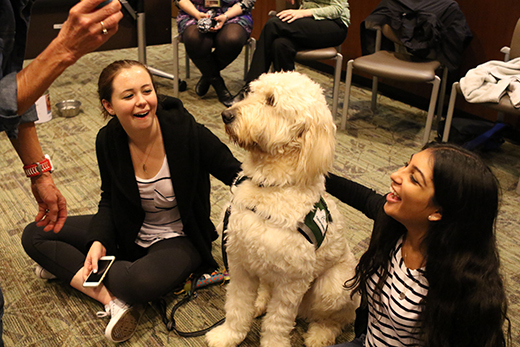 The dog study break is a valuable opportunity for students, Mooney says. Studies have shown that petting a dog can lower blood pressure and reduce stress hormones. Savanna Smith, a sophomore, agrees. “I feel very passionate about animals, especially dogs, and I also feel very passionate about not being stressed," she says, adding that the study break definitely helps her with both.